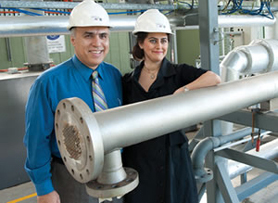 Driven by the desire to reduce greenhouse gases, Professor Behdad Moghtaderi is transforming the energy and mining sectors using his revolutionary GRANEX heat engine and greenhouse gas abatement technologies. Attracting more than $48 million in research funding in the past 12 years and with more than 220 publications, the world-renowned chemical engineer has helped solve some of the biggest issues in improving energy efficiency and developing low emissions coal and renewable energy technologies. "Reducing global greenhouse gas emissions has always been the driver of my research – the future of our planet depends on it," Professor Moghtaderi said. "These innovations are not only important economically for industry, but to society's overall quality of life, health and environment," he said. Professor Moghtaderi and his 30-strong research team, based at the University of Newcastle's world-class interdisciplinary research facility Newcastle Institute for Energy and Resources (NIER), are currently working on delivering safe, new methods of managing ventilation air methane (VAM) generated by underground coal mines. The release of fugitive methane emissions is a by-product of underground coal mining and accounts for 64 per cent of all greenhouse gas emissions from the coal mining sector. Announced in 2014, Professor Moghtaderi will lead two research projects that will address some of the major technical barriers to the full scale commercial deployment of VAM emissions abatement technologies, including the critical challenge of safe connection to the ventilation systems of underground mines. The two projects received a total $30 million in funding from the Australian Government's Department of Industry and ACA Low Emissions Technologies Ltd. Comparing his technologies to 'insurance' for climate change, Professor Moghtaderi said the VAM technology can potentially reduce fugitive methane emissions from underground coal mine operations by up to 90 per cent, reducing Australia's total national greenhouse gas inventory by about three percent and save industry millions. "On an Australia-wide scale, removing VAM emissions from underground coal mining operations would be the equivalent to removing 2.8 million cars from our roads." Once developed, the project outcomes will be equally applicable in other countries with underground coal mines. "People take out home and car insurance to protect their assets and themselves from unknown events in the future. A similar rationale can be applied to energy technologies. "We might not fully understand the impacts of climate changes, but are we comfortable with doing nothing and hoping that everything will be OK?" The research gained popular attention when GRANEX featured on the ABC TV's The New Inventors in 2011. "I always enter my first lecture with a hot cup of coffee, which I place under a scaled model of a sterling engine connected to a propeller. The heat from my coffee powers the propeller blades of the model. It is a simple example of how waste heat can be used. I have been using that demonstration for ten years now and will never grow tired of seeing how excited it makes my students." The technology delivers higher thermal efficiencies than conventional power plants, improving cycle efficiency and increasing the net electrical output from a given heat source by around 40 per cent. A solar thermal combined power and heat plant using GRANEX is expected to be fully operational by March 2014 at the Wallsend public pool. "We recently installed GRANEX technology to heat a local swimming pool. This is now a recreational resource for the community that can be used all year round, instead of just the warmer months." "This is just one example of the commercial applications for GRANEX. It has significant potential international market value and could generate billions of dollars." The revolutionary device is capable of using heat sources that might not otherwise be viably recycled, such as the flue gas from a coal-fired power station, exhaust from a diesel engine or heat from a geothermal source. GRANEX was created after Granite Power Pty Ltd approached the University' commercial arm, Newcastle Innovation, looking for help to solve a problem they were having regarding developing commercially attractive geothermal energy technology. Professor Moghtaderi said the ease with which industry could approach and work with global leaders had helped cement the University of Newcastle's reputation as being at the international forefront of research into clean and sustainable energy sources. "The spirit of research here at the University of Newcastle is that we have a strong solutions-focused approach and want to see this research applied to the real world – we aim to be pragmatic and practical," said Professor Moghtaderi. "With NIER, a world-class interdisciplinary research facility both here on campus, Newcastle truly is Australia's hub in energy research."